Hotel View Point, located on the top of the Nagarkot Hill and established in 1990, offers 45 Deluxe and Standard rooms with all modern amenities of international standard. Well-furnished carpeted and wooden paneled rooms provide private baths with hot and cold showers. 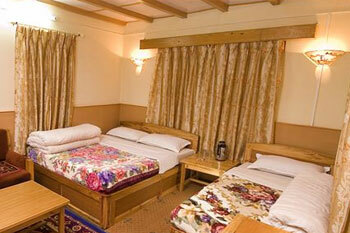 45 Deluxe and standard guest rooms with 360 Panoramic view of Himalayas form your bed rooms. Captivating scenes include Sunrise, Sunset and great mountain peaks of Mt. Manaslu to Mt. Everest. Most rooms have balconies facing view of Mountain Terrace and the Himalayan Range. Super Deluxe rooms are equipped with STD/ISTD Telephone,Television and Mailing Facilities. Standard rooms are equipped with STD/ISD Telephone and Mailing Facilities. Vehicles on hire, Laundry Service, Luggage storage and Parking Facilities. Fully equipped conference hall capacity up to 60 persons. Cozy open fire in restaurant. Daily tourist bus service to Nagarkot and Kathmandu. The staff are dedicated to give the guests a warm and friendly atmosphere and will ensure personal attendance whenever needed. The staff will surely add to the joy of your stay. Once experiencing the homely atmosphere of Hotel View Point you will return again and again.